A user viewing an electronic page on an eBook reading device. An e-book (for electronic book, ebook, or ecobook) is the digital media equivalent of a conventional printed book. Such documents are usually read on personal computers or on hardware devices known as e-book readers or e-book devices. During the late 1990s, developments in information technology and information science, the availability of low cost quality computers, electronic reading devices, and subscription to communication networks contributed to the rise in popularity of the e-book. Early e-books, made around the 1980s and 1990s, generally were written for specialty areas and meant to be read only by small and devoted interest groups. The scope of the subject matter of these e-books included technical manuals for hardware, manufacturing techniques, and other subjects. E-books gradually gained popularity due to developments in information technology. From late 1990s, the Internet became popular, low cost quality personal computers appeared in the market, and the cost of Internet access went down, which all contributed to the popularity of the e-book. Numerous e-book formats emerged, some supported by major software companies such as Adobe's PDF format, and others supported by independent and open-source programmers. Multiple readers naturally followed multiple formats, most of them specializing in only one format, and thereby fragmenting the e-book market even more. Due to exclusiveness and limited readerships of e-books, the fractured market of independents and specialty authors lacked consensus regarding a standard for packaging and selling e-books. Many e-book publishers began distributing books that were in the public domain. At the same time, authors with books that were not accepted by publishers offered their works online so they could be seen by others. New marketing models for e-books are being developed, formats are beginning to homogenize, and dedicated reading hardware has been produced. E-books have achieved global distribution, and electronics manufacturers are releasing more e-book readers for general consumer use, such as Amazon's Kindle model or Sony's PRS-500. E-books have seen tremendous market growth in some countries such as Japan throughout the 2000s. A writer or publisher has many options when it comes to choosing a format for production. While the average end-user might arguably simply want to read books, every format has its exponents and champions, and debates over "which format is best" can become intense. The myriad of e-book formats is sometimes referred to as the "Tower of eBabel." For the average end user to read a book, every format has its advantages and disadvantages. Text can be searched automatically and cross-referenced using hyperlinks, making the e-book format ideal for works that benefit from such functions. Because they require little space, e-books can be offered indefinitely, as opposed to going out of print, allowing authors to continue to earn royalties. Readers who have difficulty reading printed books can benefit from the adjustment of text size and font face. 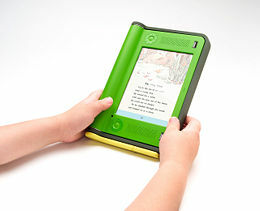 E-book devices allow reading in low light or even total darkness by means of a back light. An e-book may be more comfortable for some to hold because it need not be held open like a physical book. It costs little to reproduce or copy an e-book, which is ideal for archival and backup purposes. Ease of distributing e-texts means that they can be used to stimulate higher sales of printed copies of books. E-books can often be purchased from reading devices themselves and do not require one to visit a bookstore. Although they require electricity to be read, the production of e-books does not consume the paper, ink, and other resources that are used to produce print books. An e-book requires the purchase of an electronic device (and possibly peripheral software) to display. As an e-book is dependent on equipment to be read, it can be affected by faults in external hardware or software, such as hard disk drive failure. All e-book devices require electrical power. Certain e-book formats can become obsolete and incompatible with future devices. Book readers are more likely to be stolen than paper books. Book readers are more fragile than paper books and more susceptible to physical damage. If an e-book device is stolen, lost, or broken beyond repair, all e-books stored on the device may be lost. Screen resolution of reading devices may be lower than actual paper, and reading on the screen can cause higher eye fatigue than reading printed books. E-books can be hacked, or disseminated without approval from the author or publisher. Book download price is still high. One of the potential problems about e-books is the ease of duplication and distribution by end users. To prevent illegal duplication, e-book producers and distributors are adopting various digital rights management programs. With some formats of DRM, the e-book is tied to a specific computer or device. In these cases the DRM will usually let the purchaser move the book a limited number of times after which he cannot use it on any additional devices. If the purchaser upgrades or replaces their devices, they may lose access to their purchase unless the user register the new devise. Some forms of digital rights management depend on the existence of online services to authenticate the purchasers. If the company that provides the service goes out of business or decides to stop providing the service, the purchaser may no longer be able to access the e-book. A subscription model may fit the e-book market rather than a book purchase model. Some e-book sellers set a price depending on the length of the period the user has access to a text. Furthermore, a user may purchase a short-term or permanent subscription to a certain text. Some e-books are produced simultaneously with the production of a printed format, though in many instances they may not be put on sale until later. E-books are also produced from pre-existing hard-copy books, generally by document scanning, sometimes with the use of robotic book scanners, having the technology to quickly scan books without damaging the original print edition. Scanning a book produces an image file, which is then converted into text format by an OCR program. As a newer development, sometimes only the electronic version of a book is produced by the publisher. E-book publishing as an industry is growing in the double digits yearly, according to the quarterly reports put out by IDPF. Among the first Internet-only publishers of new e-books were Boson Books, Hard Shell Word Factory and Online Originals, all founded in the mid-1990s. Each pioneered different aspects of what has since become common practice among e-book publishers, e.g. the support of multiple formats including PDFs, the payment of much higher royalty rates than conventional publishers, and the online presentation of free samples. Hard Shell Word Factory set the first professional standards for commercial e-books and pioneered author-friendly contracts. Online Originals was the first e-book publisher to win mainstream book reviews (in The Times) and a nomination for a major literary prize (the Booker Prize). Since the late 1990s, the many newcomers to e-book publishing have included most major print publishers. At the same time, many established e-publishers started to offer print versions of some of their titles. Thus the line between the two is fast blurring. E-books have their own bestseller lists, including those compiled by IDPF, BooksOnBoard and Fictionwise. There are two yearly awards for excellence in e-books. The longest-standing and most inclusive of these is the EPPIE award, given by EPIC since 2000. The other is the Dream Realm Award, awarded to e-book in science fiction, fantasy, horror, and speculative fiction. ↑ Cory Doctorow, Giving It Away, Forbes.com. 12.01.06, 12:00 PM ET. Retrieved July 8, 2008. ↑ For instance the screen resolution of Amazon Kindle is 167 ppi versus 600-2400 ppi for a typical laser printer. ↑ The EPPIE Awards, EPIC. Retrieved July 8, 2008.
ebrary, Inc. Ebrary's Global Ebook Survey. Palo Alto, Calif.: ebrary, 2007. Fox, M.K. 2006. "PRODUCT PIPELINE: the Latest Ebook Devices and What They Mean for Librarians." LIBRARY JOURNAL -NEW YORK-. 131, no. 6: 18-23. Hane, P.J. 2002. "Open EBook Forum Releases Industry Report." INFORMATION TODAY. 19: 28-30. LaGuardia, C. 2007. "A Print "Tradition" on Ebook." LIBRARY JOURNAL -NEW YORK-. 132, no. 8: 25-25. O Leary, M. 2001. "EBook Scenarios." ONLINE -WESTON THEN WILTON-. 25: 62-64. Doctorow, Cory. February 12, 2004. Ebooks: Neither E, Nor Books, O'Reilly Emerging Technologies Conference. Doctorow, Cory. Giving It Away, Forbes.com. 12.01.06, 12:00 PM ET. Lynch, Clifford. May 28, 2001. The Battle to Define the Future of the Book in the Digital World, First Monday - Peer reviewed journal on the Internet. Menta, Robert. December 26, 2000. Read an e-book to your child, go to jail?, MP3 Newswire. Pastore, Michael. January 28, 2008. 30 Benefits of Ebooks, Epublishers Weekly. This page was last modified on 4 October 2017, at 15:37.